I’ve been dying to make these dumplings ever since I first opened my Smitten Kitchen Cookbook last October (when I went to Deb’s book signing party, obviously) – but since peaches are a summer fruit, I’ve been patiently waiting to make them until now. My dad’s favorite dessert is anything involving peaches, and his birthday is in mid-July, so my goal was to make them for his birthday dinner. 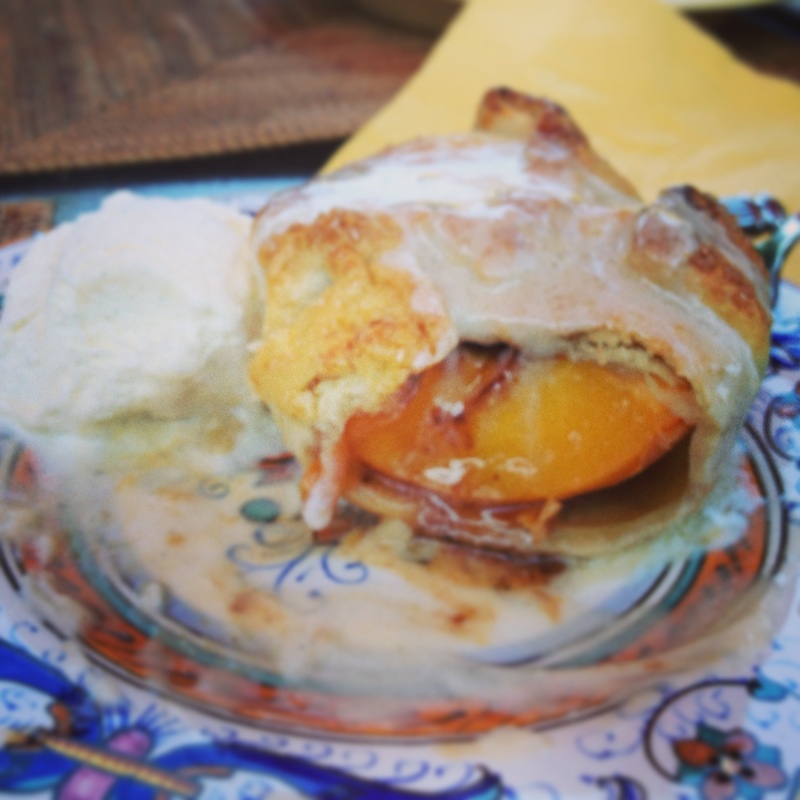 July came and went, however, dumpling-less (you know summer is way too busy when you can’t find time to make your dad peach dumplings for his birthday!!). So when I was at my parents’ house this weekend, I decided to make them for a belated birthday dessert. The birthday boy tried to ruin my plan by announcing that he’s not eating gluten, but I chose to ignore that minor detail and made them anyways. And what do you know, he ate his entire dumpling – they were just way too good to pass up. After sampling peaches from literally six different booths at the farmers’ market on Saturday morning, I ended up getting these at Whole Foods – but they were local and so, so sweet and juicy and delicious. Luckily the recipe only calls for three, so if you happen to get a bag of five or six you have a few to snack on. 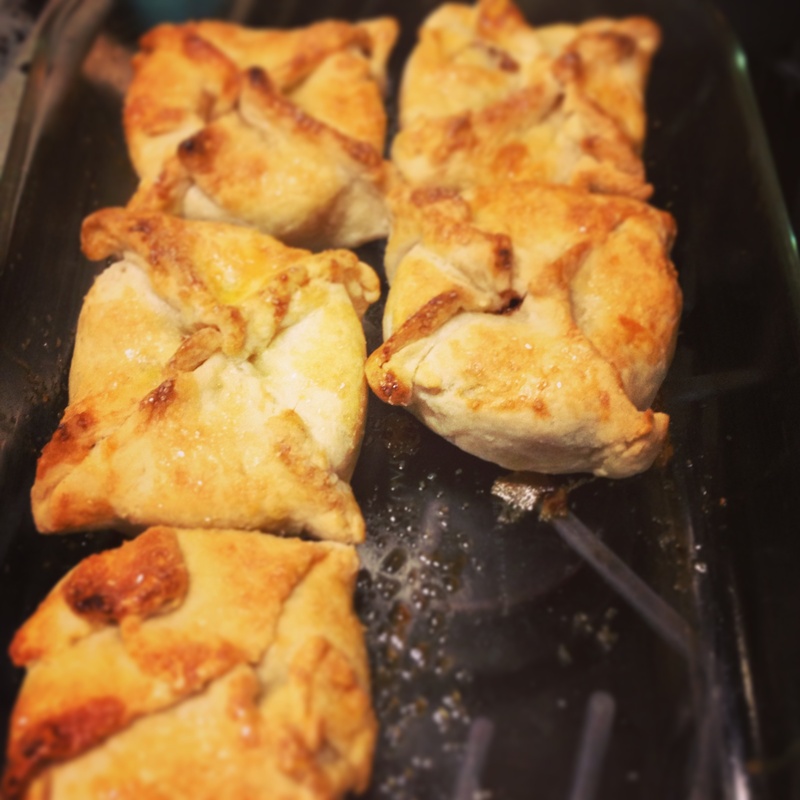 The only difficult part of this recipe is the pie dough – and it’s not really even difficult, its just that I’m not a pie dough expert and thus my dough did not roll out into a perfect rectangle like the recipe said it would. I should maybe say it’s the only time consuming part – everything else is quick and easy. I don’t want to tell anyone to use store-bought dough, but technically if you wanted to, you could (I feel like I point out this shortcut a lot, but it’s only because I really want you to make this, and I’m afraid most of you won’t because you’re afraid of pie dough). Having said that, this crust recipe is really, really good. Anyway, once your dough is rolled out, you’re golden. Mine just took the longer route to get to six 6-inch (ish) squares, but once it got there the rest was a snap. All of the sudden I feel like I’m making Chinese food. 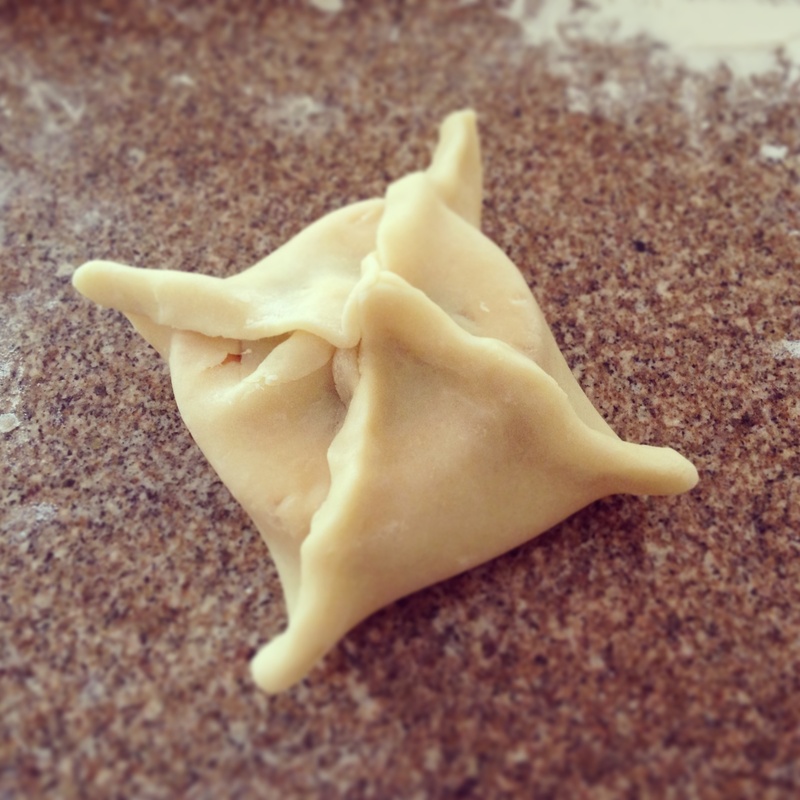 It’s a little dumpling – how cute is that!?! Just put a teeny, tiny dab of butter on your peach half and fold it up. I definitely had to re-chill my dough, though, as after about my second dumpling it was pretty soft and thus harder to fold/crimp. All the crust hardships were worth it, though, because 45 minutes later this deliciousness came out of my oven. 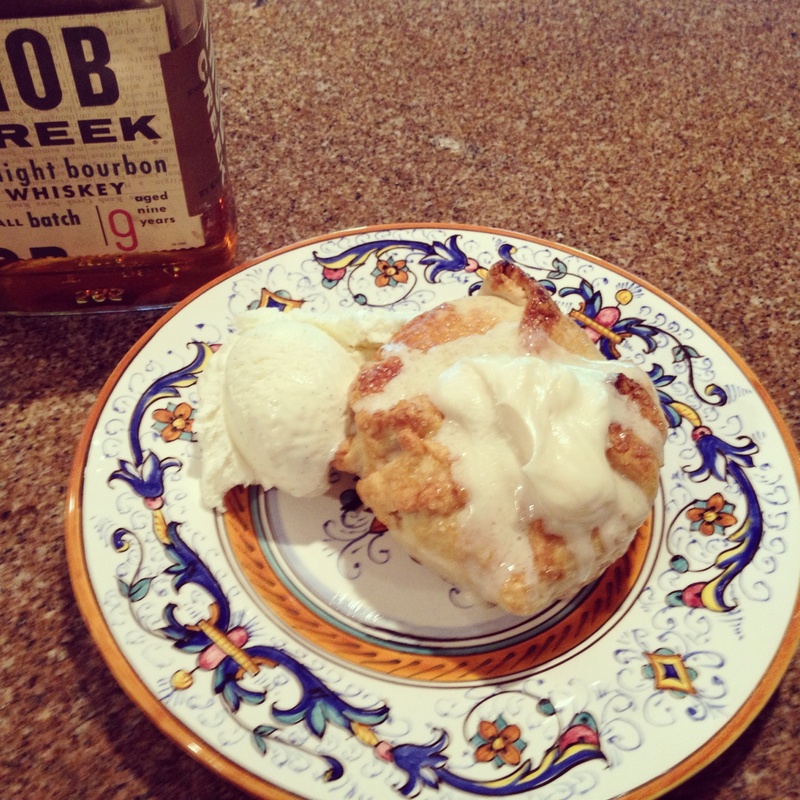 I served it with the bourbon hard sauce (Deb gives you the option to just use a few dashes of vanilla and a tablespoon of water if you don’t want to use alcohol, but I thought the bourbon was pretty dang good) and vanilla ice cream and it was really was pretty close to perfection. The butter and sugar melt together with the peach juices to make a delicious caramel-y sauce, the crust is flaky and crunchy and divine, and then there’s a whole (technically a half, but an intact half) peach inside! Deb says its one of the best things she’s ever made, and I’m inclined to believe her. Make Crust: Instructions here. Deb will explain why she thinks mixing your crust by hand results in the flakiest crust, but I’m lazy and did mine in a food processor, and it turned out just fine. If you don’t have a food processor, however, a pastry cutter will work – and your crust will probably be flakier than mine. Roll your dough out to a 12-by-18-inch rectangle (this is pretty tricky, mine did not look as good as Deb’s looked in her pictures), and divide into six 6-inch squares. 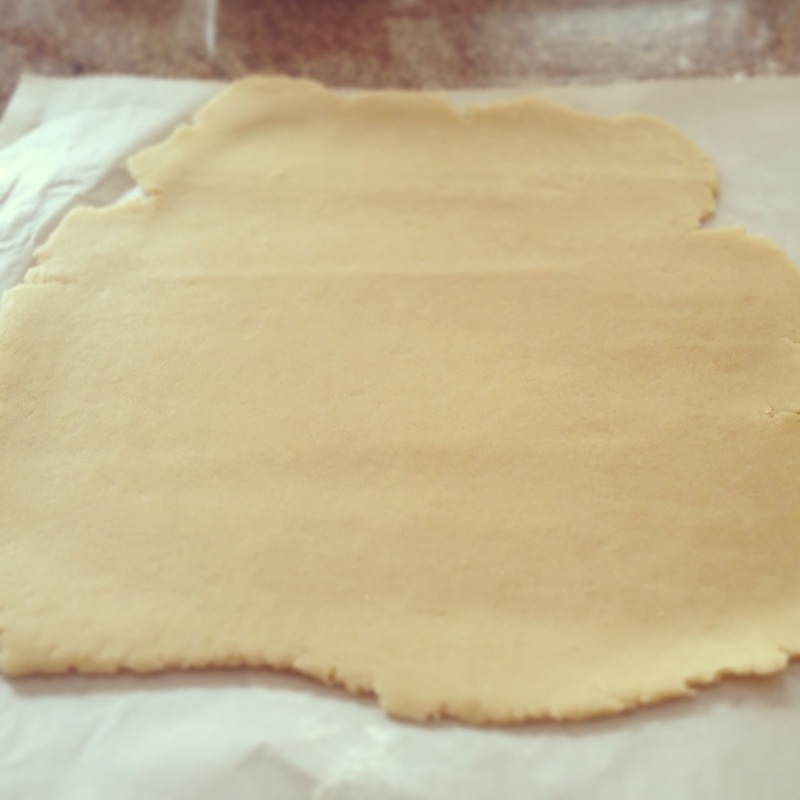 If dough gets too soft or warm while you’re rolling it (mine did), continue to the square stage, but then transfer the squares to a parchment-lined baking sheet and chill them in the freezer for a couple minutes, until they firm up again. 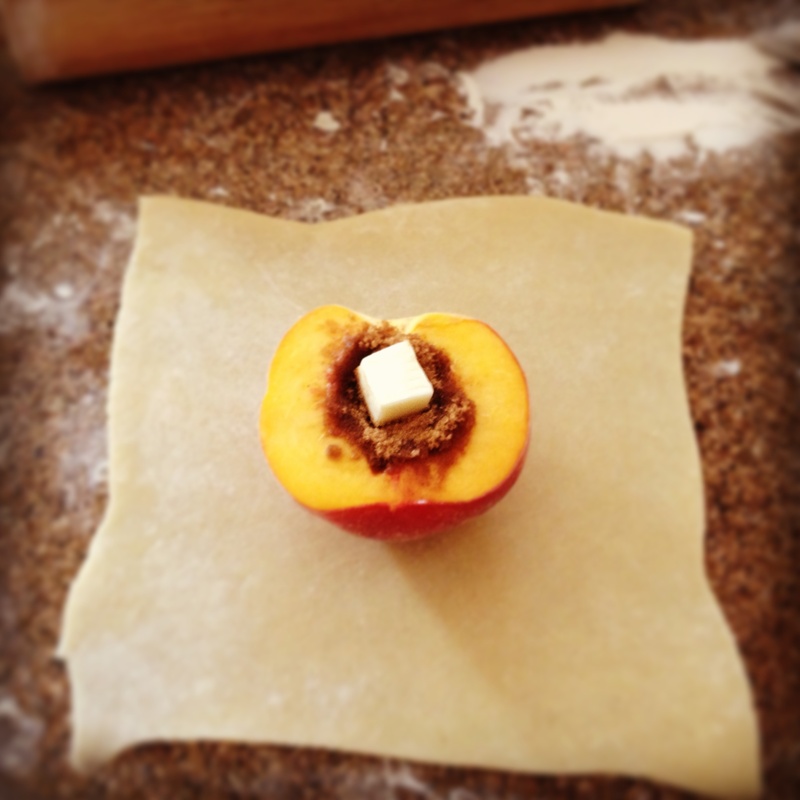 Make Filling: Halve peaches and remove pits. Deb recommends scooping out a little extra flesh from the pit indentation with a melon baller, so that there is more room in the “belly button” of the peach to pack the filling. Assemble Dumplings: Mix brown sugar, salt, cinnamon, and nutmeg together in a little dish. Spoon one lightly packed tablespoon on top of each peach half, smooshing as much of the sugar mixture as you can into the center. Dot the top of each with a piece of the cold butter. Center a peach half, cut side up, in your first pastry square. Bring corners up to meet each other over the center – if it feels tight, or as if you’re short of dough, make sure that the dough underneath is flush with the peach curve; it tends to get slack – and seal the seams together, pinching with your fingertips. Bake Dumplings: Arrange dumplings in a buttered 9-by-13-inch baking dish, and chill for 30 minutes. Preheat your oven to 375 degrees. Whisk egg together with one teaspoon water to form a glaze. Brush glaze over the tops and exposed sides of dumplings (I then sprinkled with demerara sugar). Bake for 30-40 minutes (mine took 45), until pastries are puffed and bronzed on top. To Finish: While baking, make the hard sauce. Beat softened butter, confectioners’ sugar, and bourbon until smooth (I added a few drops of vanilla here as well). Scrape into a serving dish. When pastries come out of the oven, dollop each (or at least the ones that will not be served to children) with a heaping spoonful of the hard sauce, and serve pastries with the sauce melting over the sides. Ice cream optional, but delicious. 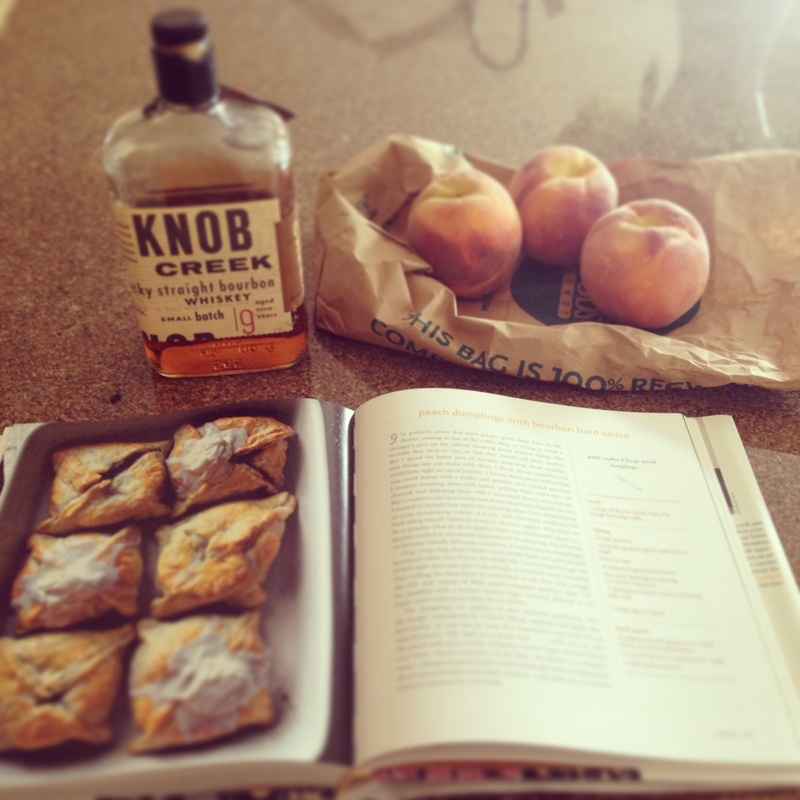 Happy Peach Season, and Happy Birthday Dad! That seriously looks amazing. I want one – RIGHT NOW! Carly, those look incredible! You are a genius. They look exactly like the ones in the cookbook! Thanks Madge! Trust me, they didn’t look that good going in to the oven – the beauty of pie crust with an egg wash, it always turns out kind of pretty no matter what you do to it 🙂 Can’t wait to see you in a few weeks! They were to die for!!! These look great! Darn, too bad I’m going on vacation just as stone fruit season is really getting going. But I bet these work just as well with pears or apples! Totally – I think this was a knock-off of an apple dumpling. Pear would be so yummy too! Hope you’re having a fab trip! Carly, I don’t know if Molly had a chance to let you know that she fixed these delicious peaches for us TWICE while we were in Sunriver. And we were only there a week. My new favorite dessert. 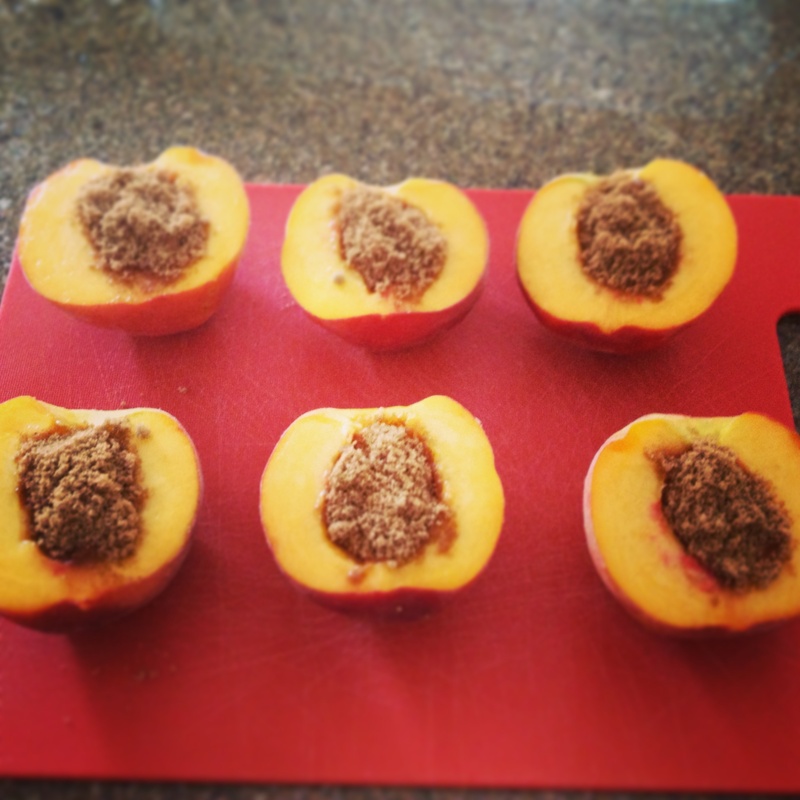 Thanks so much for sharing and I have a new batch of peaches ripening on the counter as we speak. Much love! Does anyone have experience freezing these? You can freeze pies so I assume it would work?